Invite along friends, neighbours, family or colleagues to have tea (or coffee!) and cake with you, and they make a donation to Talkthru for their refreshments. It really is that simple! Where - Your home... workplace... sports club... toddler group... church group... community... youth group... school... any venue of your choice. When - Monday 1st - Friday 12th September 2014. At a date and time to suit you and your guests. You can hold the event as many times as you like! Phoenix cards Phoenix cards catalogues are available and 100% of the profits will go to Talkthru! Your guests can simply give you the order and payment, and items will be ordered by the end of the month. 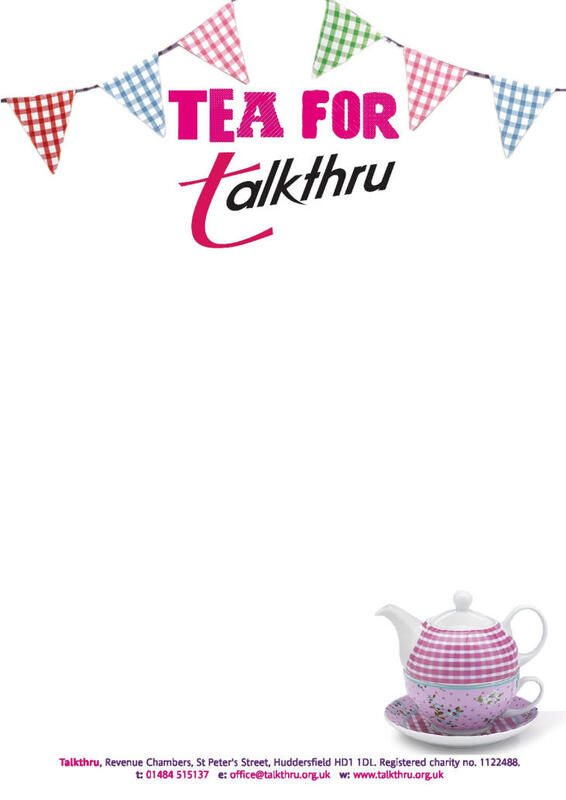 What do I do now Fill in the contact form below or call 01484 515137 to register your interest and ask for your ‘Tea for Talkthru’ pack.This will help make planning your event really easy. Your donation will make a difference to lives affected by unplanned pregnancy, miscarriage and baby loss, and to the wellbeing of babies in families suffering financial hardship. Thank you for your support.